A small selection of some of my favourite films. Not surprising to see so many sci-fi, fantasy and generally eccentric movies but I didn't realise how many French films I liked, or how many featured Bruce Willis. A young woman in Paris, inspired by a chance discovery, sets out to secretly bring happiness to people around her and finds herself drawn into a romantic mystery of her own. Wonderfully inventive & visually delightful this is a celebration of life as a bubbly, exciting adventure. I'm a big fan of the films of Jean-Pierre Jeunet and this is probably his most playful & positive. The story of Faust transposed to 1960's Swinging London with Peter Cook & as the Devil and Dudley Moore attempting to sell his soul for worldly rewards. Some great comedy and more than a touch of social commentary as the seven promised wishes are subverted away from their intended result and the seedy reality behind the glamour is revealed. This refers to the 1967 original and not the ghastly 2000 remake. A typecast film actor attempts to revive his artistic credibility with a Broadway play. Technically amazing - there's only one obvious cut in the entire runtime - the seamless transitions between viewpoints, locations and onstage/offstage leads you into a blurred reality where no edges are sharp or distinct. A bit over-wordy at times but a wonderfully immersive story. A madly inventive film from Emir Kusturica about life, love, smuggling, music & family in 1990's Serbia. The characters are larger than life, the plot jumps around all over the place and there's Rom (Gypsy) music all the way through. Huge fun. A writer who has recently lost her sight is learning & discovering how to operate in her new state. A fascinating look (no pun intended) into perception, projection and how we construct a world around ourselves. Initially quite disturbing the humour, humanity and clever blurring of real & fictional bring her world into 'view'. A surreal adventure in an alternative, slightly hallucinatory world. The plot involves kidnapping children to steal their dreams, a biomechanical cult (a sort of steampunk Borg), narcoleptic clones, a brain in a fish tank, a trained flea who injects mind-controlling drugs into victims, and much more - hard to sum up but it (mostly) makes sense. Visually stunning, both for its cinematography and special effects, engrossing & delightful. One of Jean-Pierre Jeunet's best. A wonderful low-budget sci-fi film that starts with a simple dinner party, looks like it's drifting into jump-scare horror territory, then makes a totally unexpected leap into something totally different. Creative & inventive, an intelligent scientific thriller that keeps you guessing for all the right reasons. Fairy tales, predominantly Red Riding Hood, retold as part of a girl's transition to womanhood. Great use of stories within stories although some of the special effects look very dated now. A chilling recreation of the Wannsee Conference where high ranking Nazis discuss the mechanics of the Holocaust. A scrupulously polite meeting hiding the horror & terror just under the surface, not just for the immediate victims but for those present who begin to discover that they are not as safe as they imagined. Inventive sci-fi from South Africa where the aliens come as unwanted refugees and are packed away into settlement camps. The news reportage style works really well, the special effects are excellent and the overall feel of bureaucratic interference & neglect is chillingly believable. It descends into action hero cliches towards the end but not unforgivably so. A romp through applied theology as two fallen angels attempt to exploit a loophole and return to Heaven. The theology is decidedly dodgy and it's unashamedly played for laughs throughout but it's still lots of fun and there are a few pertinent points made. Contains the best portrayal of God (or at least Yahweh) I've seen in film. A drug addict in 1970's America is brought to a point where he decides to reexamine his lifestyle. Rare to find a film about drug taking that remains observational rather than preachy, letting the ups & downs of the crew speak for themselves. An insightful view of the challenges involved in making a major change in your life. If you knew that a relationship would end in a painful, messy break-up would you ever enter into it? Do we erase such memories so we end up making the same choices again & again? A neat sci-fi device brings these idea out but doesn't overshadow the emotional heart of the story, the amazing special effects and non-sequential timeline are impressive without being distracting, but it's the superb acting that holds the whole thing together. Believable romance. A successful executive finds his comfortable life coming apart as he looks for (or is driven to) something beyond simple consumerism. A savage but insightful (& funny) look at modern life, especially for men. This is a rare example of a film that's much better than the book it's based on. An up & coming New York talk show host finds his career ruined by an offhand remark on air. Years later, as he wallows in his misfortune, a chance encounter brings it back into sharp focus. A glorious tale of despair, redemption and the power of myth in everyday life. One of Terry Gilliam's best films, certainly one of his most optimistic. How do you make a comedy about fundamentalism? It's admittedly very black humour but it manages to juggle hilarious situations with very real shock at the outcomes. An all too believable story of ordinary people being drawn into extreme actions. A quirky British sci-fi film that starts off with a schoolboy crush and mushrooms out into scientific research, secret government agents, fate & free will. The timeline is rerun from different characters' perspectives with new insights and motivations being revealed with each iteration. The final conclusion was a little disappointing for me but it's nice to see a film playing with structure so confidently. A surreal mapcap comedy from 1941 starring Olsen & Johnson in an adaptation of their hit stage show. There's a story about putting on a show but that exists inside the film that's being discussed within the film itself and the narrative framework is continually subverted or plainly ignored. Like Laugh In, its most obviously influenced modern show, the slight structure was mostly a background for a continual stream of gags & running jokes. Considering that it's nearly 75 years old it stands the test of time amazingly well. Any film featuring existential detectives has to have something going for it. A light & light-hearted romp through philosophy and personal therapy, and that's something you don't hear very often. Fun. What's really going on in someone's head? An insightful look into personality as the slapstick antics of a young girl's emotional archetypes contrast with the very real life transitions she's working through. 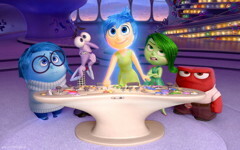 Gorgeously animated, it's often laugh out loud funny while remaining perceptive & moving. A mob hitman finds himself taking care of a young girl but as the film progresses it's less clear who is taking care of who. A wonderful example of an odd couple where each provides (& provokes) something missing from the other. Amazing performances from both the leads & supporting cast as the story freewheels between tender innocence and full-on action scenes. Possibly Luc Besson's finest work. A poignant love story set in France just after the end of the First World War. A young woman goes in search of her fiance who was lost (and possibly died) in a tragic incident in the trenches. Another wonderful film from Jean-Pierre Jeunet with quirky characters, inventive storytelling and brilliant cinematography. Time travel sci-fi with a young man assigned to kill his older self. As with so many time travel stories the plot doesn't really stand up to any sort of rational analysis but it moves along entertainingly and the interaction between older & younger versions of the protagonist are well done. A lone astronaut working on the dark side of the moon finds his life starting to unravel as he approaches the end of his three-year work contract. A freak accident results in another, identical astronaut appearing at the base and the AI system will only give evasive answers when questioned about it. A neat story with excellent (& restrained) special effects but it's the emotionally powerful acting that raises this above the average. A delightfully straight-faced mock documentary about a rising star fighting the entrenched establishment in the world of... Morris Dancing. A joyful & affectionate poke at that most quirkily English of folk traditions, neither going for cheap laughs or taking itself too seriously. A nerd and his sister find themselves transported into a 1950's black & white TV sitcom where their attitudes slowly undermine the comfortable sureness of its idealised world. What could have been a simplistic attack on older attitudes instead shows how both sides have things to teach the other and avoids pat answers. The amazing special effects and subtly evolving soundtrack work wonderfully in supporting the sense of change & emerging depth to both characters and their society. A chameleon goes through an existential crisis (which is hilarious in itself) when he's (literally) thrown out of his world and deposited in a Wild West town as the new sheriff. There's a plotline about power, corruption & trust but it all plays second fiddle to the hero's search for identity & purpose. Amazing animation, a sharp & witty script and some great laughs along the way. Boy meets girl in the comic strip & arcade game fuelled landscape of his imagined world. Fast, frenetic & fun it's also a rare example of a film capturing the feel of playing in an young rock band. Although based on the Scott Pilgrim comic books the film takes a small subset of their content to produce a short, punchy story. Both are well worth the time. A sweet love story with the twist being the power exchange (dominance/submission) aspect of their relationship. No leather straps or ball gags, this is a story of two people slowly & cautiously revealing their unorthodox desires to each other. An odd couple of psychic investigators find themselves in trouble during a strange missing persons case. This is a marvellous film, the casting, acting, writing & cinematography are all superb and the bizarrely weird storyline is engrossing & engaging. A moving story about friendship, family, difficult transitions and trust. A surreal French animation in silent movie style - lots of sounds & music but no talking. A professional cyclist is kidnapped while racing in the Tour de France leaving his grandmother and her faithful old dog to go in search of him. Wonderfully strange. More time travelling, this one has a reformed 'criminal' from the future sent back to try and forestall a devastating terrorist attack. Another dark, fatalistic vision from Terry Gilliam, a modern tragedy (in the classical sense) bringing out the hope & humanity of the central characters. A very unusual superhero film with no spandex suits or building-smashing fights. A security guard is slowly led to the realisation that he has special powers but his mentor turns out to have secrets & agendas of his own. An atmospheric study of the challenges of being exceptional. The darker side of modern paganism and the use of ritual. An isolated community follow their unconventional beliefs to their logical but drastic conclusion. I like the fact that both sides are presented as having unquestioned assumptions and although the villagers are presented sympathetically there is no clear division into good and evil. This refers to the 1973 original, not the dreadful 2006 Hollywood remake.